If we learned anything from last week's South Park episode that spoofed TAPS, it's that dead celebrities are sometimes held up on a psychic runway, awaiting departure. 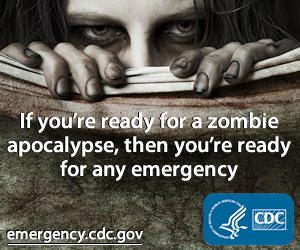 I'm no expert, but that sounds about right to me. If it is true, then it looks like Jim Morrison showed up late to the gate and missed his shot to board. 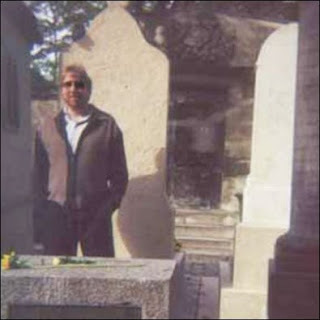 The Daily Express newspaper in the UK broke the story that respected American rock historian Brett Meisner claims to have caught The Doors frontman's ghost on film in 1997, hanging out in front of his grave at the Père Lachaise cemetery in Paris (seen here, maybe, to the right of Meisner towards the background). bathtub in 1971. So if researchers say it's real, that has to mean something, right? The release of the image is to drive coverage for the new book, Ghosts Caught on Film 2 (Released just in time for Halloween - coincidence? I think not). So let the debate over whether the image is legit, fake or a trick of faulty film begin. Personally, I have no dog in this fight, other than to say that Morrison's grave is a tourist hotspot in the necropolis, along with many other graves of famous people. So it's no real surprise that Meisner would visit it. Although I am a little jealous of him. The last time I visited the grave, I only encountered a stoner dude who looked like he'd be hanging around the grave since Morrison was buried. "The CIA Murdered Jim Morrison, Janis Joplin, Jimmy Hendricks...." It's Jimi Hendrix! My 2 cents!